Categories: Activities, News | Tags: activity, baby class, baby music class, baby music class boston, children, classes, coco baby, education, fall, kid's music, kids songs school, little lovage club, marcie, music class, music lessons kids, parenting, performance, preschool music, register, sign up, south boston, toddler music class, toddlers classes music | Permalink. 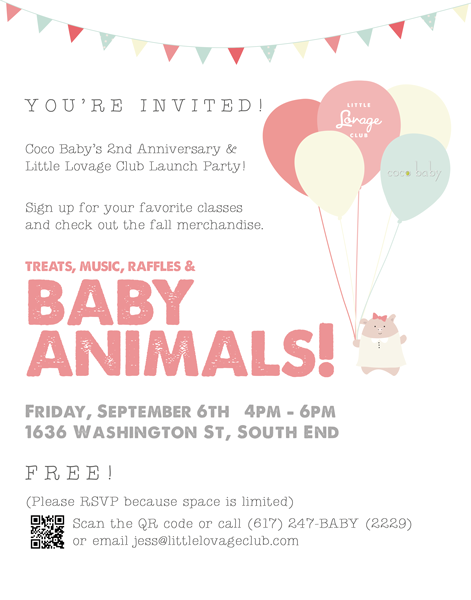 RSVP to Little Lovage Club Launch and Coco Baby’s 2nd Anniversary Party on Sept 6 from 4-6. There will be music, baby animals, a chance to sign up for classes, viewings of new fall merchandise and so much more! Categories: News, Performances & Donations | Tags: activity, baby animals, boston, boutique, children, coco baby, fall classes, free, free music, kid's music, launch party, little lovage, performance, toys | Permalink.